1. Check out locations: Select a location depending upon the style of your wedding and your guest list. Unless it is your hometown, you can’t expect everyone to attend your wedding, especially if you are planning for a beach that needs traveling for many people. You have analyze the facilities offered at the venue, if you are getting married in a private beach, make sure about the permit fees, clean up charges and container laws. 2. Early start is very important: You should begin researching and planning for your beach wedding ahead of time. Apart from reserving your venue, you should also complete various types of permit requirements of the state where you are planning to get married. For instance, some venues may need to you to provide details on all the equipment that you will be taking with you to the venue, and also the beverages and food to be served on the venue. You should not forget that you will also need plan to clean up after the event, which is an important aspect of wedding. 3. Ask proper questions: while you are at the venue to reserve the day for your wedding, you should make sure that you ask right questions to the owner or the manager of the place. You should try to get as much information as possible, after all you are on your way to achieve your dream wedding and you need to make ideal selections. 4. Being flexible is important: Nature doesn’t work according to us. 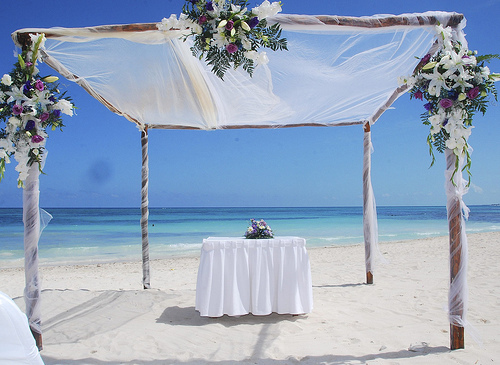 You should always be ready with an alternative or a back-up plan if you have planned for a beach wedding. If something happens with weather and in case getting married on beach seems impossible, you should have your back up plan ready to change the plans.